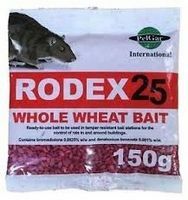 Rodex Rat Poison Sachets 20 x 150g is a loose wheat based grain bait prefered by rats. Suitable for use indoors and outdoors, in and around buildings. * Easy to use in ready to use bait bags. * Grain bait most preferred by rats. * Use in our Tamper Resistant Rat Bait Boxes where bait may be found by children and pets.